Coherently to our basic strategy, Dream Chamber has been created to develop and to test a new technology that will become an Alittleb.it’s product: “Real Chamber”. So, very soon, Alittleb.it will be able to offer to its clients an innovative and very effective new approach to Game-Based Marketing: “Real Chamber” has been conceived to allow Alittleb.it to rapidly develop optimized multiplatform Graphic Adventure, set in real locations, minimizing entrance-barriers for users. to use photographs to create the environments, without requiring expensive and time-consuming 3D reconstructions. Company tours: to describe innovative process; to let clients see quality assurance processes; to narrate the company history; etc. etc. E-learning for Employees: to teach to new employees spaces, procedures, standard approaches to clients, etc. etc. Educational Products: Museum Tours; Simulations of way of living; etc. etc. So, come back soon: we’re unveiling and effectively introducing our terrific “Real Chamber” technology! A humorous adventure with a quirky cartoon graphic style. Immerse yourself in 30s America, between Prohibition and the Great Depression, and discover Charlie, a rich heir who divides his time between social obligations and his hobby as a private detective. During yet another official museum opening, Charlie witnesses a robbery, the victim of which is none other than his own girlfriend. Firmly set on investigating the case despite the reluctance of his uncle, the detective in charge of the inquiry, he unknowingly embarks on what will become the greatest adventure of his life! Thanks to his unique skill and unrivalled memory, Charlie explores and investigates all the way into his dreams! 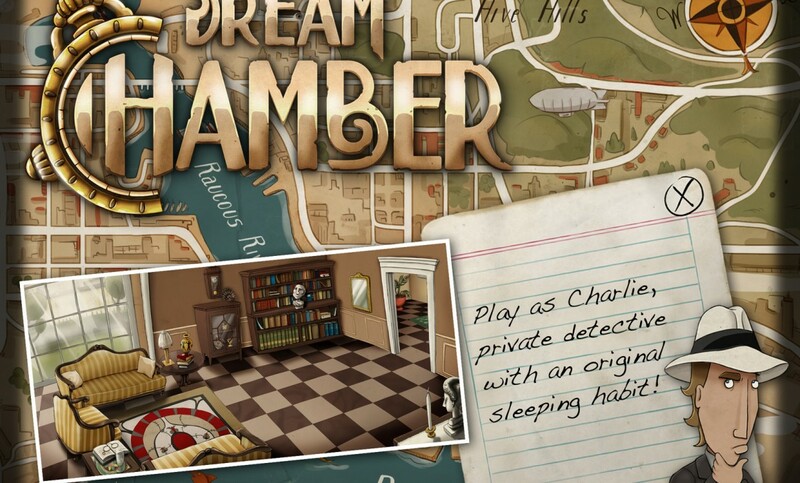 In true adventure game style, Dream Chamber will delight the genre’s fans and captivate new players! A unique graphic style! All handmade graphics! Revisit your investigation scenes in your sleep and you might find the answers in your dreams!